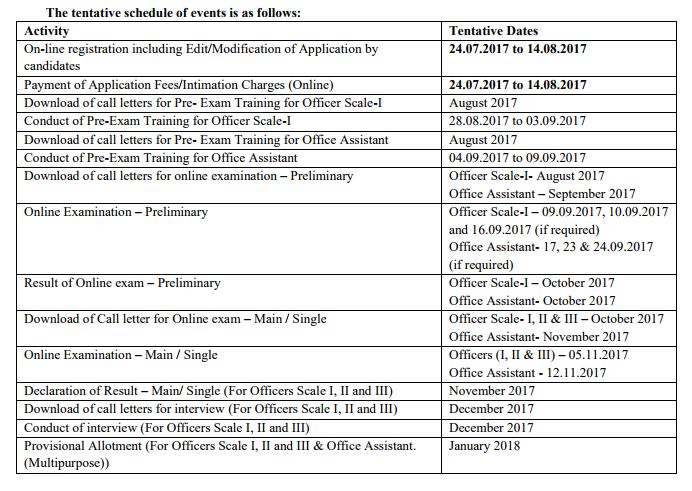 The online examination for the next Common Recruitment Process for RRBs (CRP RRBs VI) for recruitment of Group “A”-Officers (Scale-I, II & III) and Group “B”-Office Assistant (Multipurpose) will be conducted by the Institute of Banking Personnel Selection (IBPS) tentatively between September and November 2017. The interviews for recruitment of Group “A”- Officers (Scale-I, II & III) under the same process will be coordinated by the Nodal Regional Rural Banks with the help of NABARD and IBPS in consultation with appropriate authority tentatively in the month of December 2017. Only those candidates are eligible who have passed Bachelors Degree in any discipline from a recognized University or its equivalent.Proficiency in local language as prescribed by the participating RRBs. Working knowledge of Computer is Desirable. Apply Online at IBPS website before 14.08.2017. A candidate can apply for the Post of Office Assistant (Multipurpose) and can also apply for the Post of Officer. However a candidate can apply for only one post in officer’s cadre i.e. for Officer Scale-I or Scale-II or Scale-III. Candidates have to apply separately and pay fees / intimation charges separately for each post.